I was here at the 2012 Paralympics National Track and Field Trials! It seemed like a dream, impossible, and yet it was real. I had been training so hard for the National Paratriathlon championships, which were the month before, and all that training had also benefitted me out on the track. 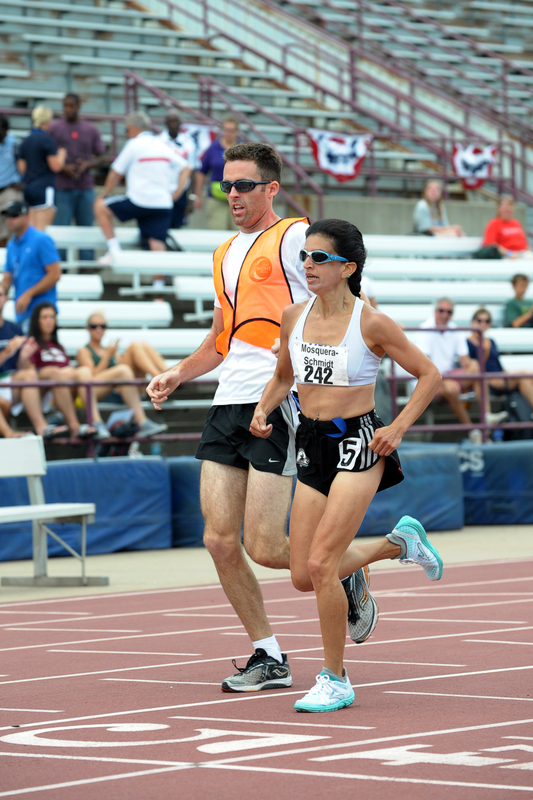 I had qualified to run “short stuff”, 200 meters, 400 meters, and 1500 meters. Short for someone who would typically say, “I love long distance.” Yet, there was something different about the shorter distances, a chance to run fast, like the wind, and push muscles in different ways than I had ever done before! My guide Bryan and I were ready! We had met in Mesa Arizona, about a month before, at the Dessert Challenge Games. He picked up guiding in a matter of seconds, and the next thing I knew we had run qualifying times in all three distances to get to National Trials! So here we were in Indianapolis, at the Michael A Carroll stadium, which has seen a lot of famous runners on its track and field. The excitement and nerves were so palpable at each event, it was something I had never experienced before. An incredible amount of mental discipline was required to keep calm and focused, and the self imposed pressure to perform at my best was relentless. The 200 Meters event was first, and it was about three minutes before the gun went off that I was introduced to starting blocks. What a riot, I had no idea how to even set these things up, let alone how to position my body to start out of the blocks. We did the best we could with the little we knew, and hoped for the best, all while thinking- “Gun goes off, start out cautiously so as not to face plant!” Lady Luck was with us that evening, and we made it through the 34 seconds of racing unscathed! With an off day between the 200 Meters and the remaining 1500 Meters and 400 meters event, it was time to practice starting out of the blocks. We’d have to do it again for the 400 Meters event. My husband John set me up on the field grass/astroterf first; if I fell while coming out of the blocks, I’d have some padding underneath me! After about 15 minutes of practicing on my own, it was time to try the start tethered to Bryan. This was then followed by moving out onto the track itself…Talk about practice and focus- The rubber surface of the track is not as forgiving as the soft grass surface, so I really had to think about not tripping and yet also not letting my body pop up straight in the air off the blocks. The best way to describe this “starting out of the blocks” is to think about keeping your body somewhat low to the ground and at a forward angle so that you can be more like an arrow flying through the air…And remember, coordinate movements with your guide so that arms don’t hit the tether and accidentally disconnect us from each other! Well, after about an hour’s worth of practice, it was time for a break and a bit of site seeing. 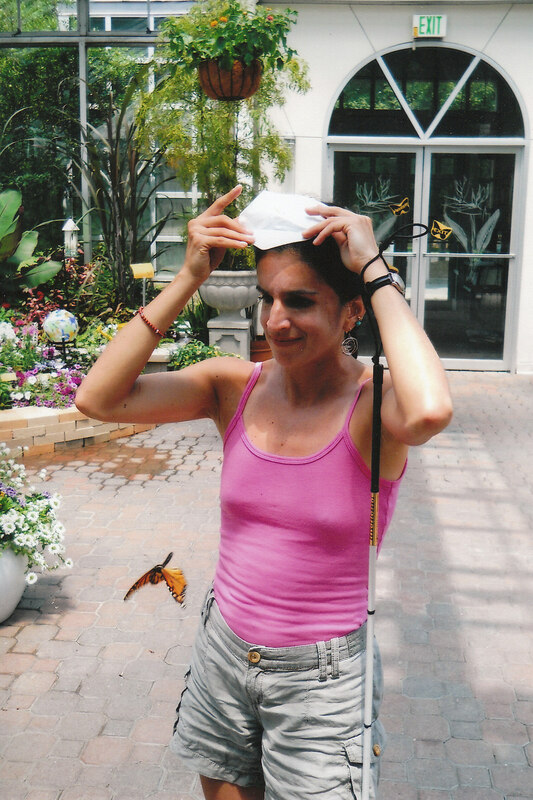 We managed to check out the Speed Way, step on the track itself, and then went off to spend a little time in the midst of nature at the Botanical Gardens, and even had a chance to release butterflies into the sky. Sunday morning came quickly. My two events were scheduled 30 minutes apart with the 1500 Meters coming first…Some “long stuff”, yay! After warming up, changing into racing flats, securing the tether on our shorts, and having my blackout glasses inspected and approved, it was time…The gun went off, and adrenalin kicked in. The first 800 meters seemed to disappear, just 700 meters to go! No sooner had I thought that, and I felt as though everything just drained out of my legs. A frightening feeling, a split second of panic, I had run so many longer races before, and never had experienced something like this moment. That’s when I realized, it’s now a mental challenge, it’s about will, inner strength, determination. This moment is about pushing through my own fears and conquering any doubts I may have about my abilities and talent; it’s about the passion for the sport of running, and it’s about being out there to inspire and encourage others. “Pick up the pace” I told myself, “fast turnover, pump your arms!” Then came Bryan’s wonderful words, “Entering the last curve in 3, 2, 1, now.” Followed by “Coming out of the curve, now, straight, final 100 Meters!” We finished in 5:30, setting an American record for totally blind women in the 1500 meters. Thirty minutes later, we were back out on the track for our final event, the 400 Meters. This one saw us have a much easier time setting up the blocks, and saw us off to a smooth coordinated start! We were set up in the middle/outer lanes on the track, which I like because the curve feels nice and smooth. Now it was about holding back a bit, and building speed throughout, which we were able to execute perfectly! Finishing time was 1:15, a Personal Best! What an incredible and memorable experience, and what a fortune to be able to share it with Bryan and John. Deep thanks to Bryan for guiding me at my first Paralympics Track and Field Trials, and for being so open to learning about guiding and persons with disabilities in such a short amount of time! I can’t wait for us to race again soon! A hug and thanks to John for his unwavering support, and for his endless desire and ability to always help others in any way possible. As always, thanks to my family, friends, running pals and supporters; great experiences are only possible because of all of you! In the spirit of a weekend that was filled with excitement, nerves, exposure to new rules, and lots of great laughs, I thought I’d try to summarize my experience in a list. Rock On with Plastic Rocks!- Yes there are such things, and they look and feel real! Physique admired by 4 Chicks who said, “You look incredible!” – I think that was for all of us b/c we were all in shorts! Tata’s Café (Closed, probably for the best!